One of the goals of Beth El Center for Early Childhood Education is to use the Nature Explore Classroom as an opportunity to extend their programming and to learn and grow just by being out in nature. As a private Jewish Preschool, Beth El Center for Early Childhood Education, serves approximately 40-50 children, of all faiths, from infants up to Pre-K during 10 months of school and 2 months of summer camp. The school takes pride on being very family friendly-where you feel like you are walking into your own living room when walking through their doors. 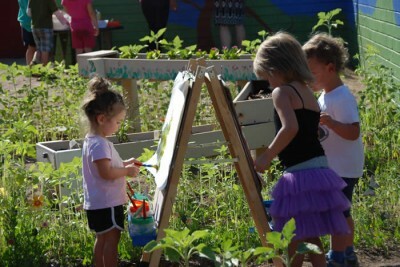 Everyone was excited about the opportunity to create a Nature Explore Classroom at the school. The children and families are involved in planting, watering and caring for plants on a regular basis. Planters and gardens have made a big difference in the beauty of the outside area. Vines are beginning to grow at the Entry Way and all around the gated area of the playground. An arbor, with vines growing up and over, creates a natural feeling as the children ride their bikes through it. Various artistic expressions are found throughout this wonderful outdoor space and areas are filled with tree cookies, tree logs, wooden blocks of various shape and sizes and other wooden items. The children love to jump from one stump to the other or turn logs over to discover what bugs might be lurking underneath. The tree house and stage area serve as a space the children use their imaginations and creativity in many ways. The Nature Explore Classroom standards and principles work perfectly with the school’s philosophy that every child is a Picasso and they are there to guide each child, letting them learn at their own pace and allowing them to create their own masterpieces.